Ancient humans have long used pottery as their main containers for storing food and as a cooking device even before the Neolithic period. These potteries were made from a mixture of water and ceramic. 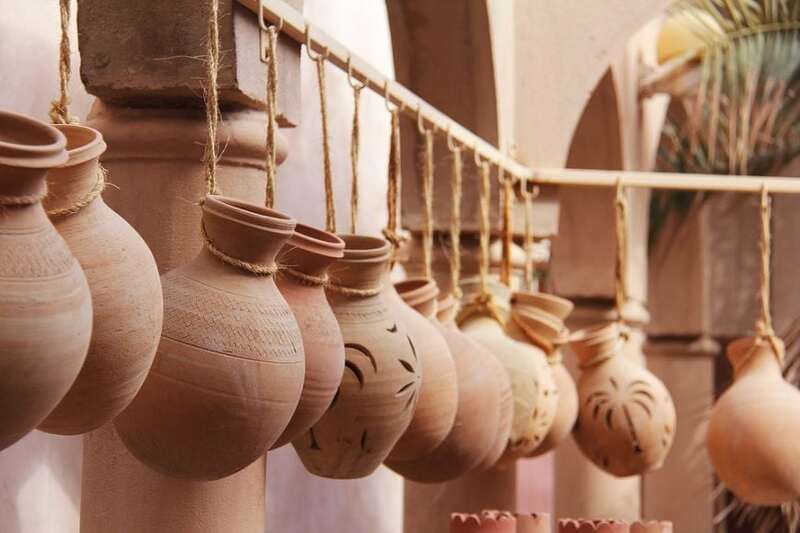 Pottery in modern societies has almost been replaced by plastics and polymers, as they are lighter, thinner, and more transparent compared to traditional bulk materials for transportation. The modern thin polymer versions are, to a certain extent, permeable for gases like water or oxygen. Permeation is the process of air or gas absorption at the plastic surface, which then passes through the material. Permeation can lead to a reduction in the lifetime of protected products. The reduction of such permeation is just one of the many future applications for organic-inorganic nanocomposites, which generated significant interest in both academia and industry. Ceramic, known as clay, can play an essential role as an inorganic material. In nanocomposites prepared from clay or other flake-like fillers, the delamination status of those fillers is essential for the performance of the whole composite. The delamination status can be categorized into three statuses: aggregated, partially delaminated, and completely delaminated (also known as an exfoliated state). In the exfoliated status, each particle is completely broken down to its single layer. The exfoliated state is the most desirable status, as it can provide excellent properties at a very low filler loading. However, it is also the most challenging status for one to achieve. The exfoliation needs to be energetically favorable, which means the material should “want” to be broken down to the monolayer. The interface reaction must precisely adjust between the material and the surrounding organic. Otherwise, it is like mixing oil and water. Surface energies evaluation offers a way to identify favorable systems. Those energies can be very practically described by Hansen solubility parameters (HSP). Materials with similar HSP values have a high affinity for each other, and those values are often used per example to find suitable solvents for polymers. With the goal of finding such suitable systems for the exfoliation of clay, I decided to study to measure the HSP values for a certain clay, and, with these values, contribute to finding solvents-polymers to achieve the exfoliated state of clay, also proving that HSP is useful for future experiments. There are several kinds of clay in this world, which come in various forms, chemical compositions, and structures. I focused on a synthetic mica, which is particularly interesting for nanocomposites due to its tremendous lateral size. Hansen solubility parameters (HSP) can be divided into three parameters: dispersion, polar, and hydrogen-bonding. The first goal has been to estimate the parameters for optical transparent synthetic mica. It is possible to measure those three Hansen solubility parameters with an optimized method . Furthermore, synthetic mica has been modified with four-different molecules (surfactants), to turn what is normally hydrophilic mica into an organophilic mica. The question is whether those different surfactants change the HSP values of the synthetic mica. Such change in the HSP values has been observed. The interesting thing is that the different surfactants changed only two of the three parameters. Furthermore, a comparison with calculated HSP values for the used surfactant showed that the experimentally-determined values were more hydrophilic. Those higher values could be due to the hydrophilic nature of mica itself, which cannot be changed entirely. The experimentally-determined values are more accurate to search for potential intriguing combinations with dispersants or polymers. For this search, the determinate HSP values were compared to the known HSP values of dispersants. The aim was to find dispersants with very similar HSP values. Those should give an energetically favorable combination, following the old saying “like attracts like.” Chloroform has been identified to be such a dispersant. The influences HSP values of the different micas on an exfoliation process are investigated in chloroform. The dispersibility of the modified micas has been predicted by their differences in HSP values towards chloroform. For this, we used the so-called Flory-Huggins theory, which can be connected to the energy need to exfoliate particles. The basic idea is that if the differences between the particle and dispersant in HSP values are small, so is the energy needed for the exfoliation. The particle then almost “wants” to be exfoliated. The four different modified micas were dispersed in chloroform via mechanical force. The measurements showed that a reduction in the HSP distance leads to an improvement in dispersibility and delamination status. In the case of a higher distance, aggregated and unstable mica dispersions were obtained. Whereas in the case of near zero difference, exfoliated and stable mica dispersions are achieved . Our work further shows that HSP values can be used to predict the delamination status of different filler materials in polymers. The results show that the filler-polymer combination used has an influence on the processability, reproducibility, as well as on the process window of the nanocomposite preparation. Similar Hansen solubility parameters enable a widening of the process window . This prediction of delamination status based on Hansen solubility parameters is found to be a very helpful tool for selecting fillers in composites. These findings are described in the article entitled Influence of Hansen solubility parameters on exfoliation of organophilic fluoromica, recently published in the journal Applied Clay Science. This work was conducted by Michael Huth from Jacobs University Bremen and Evonik Taiwan Ltd, Ching-Wen Chen from Evonik Taiwan Ltd, and Jonas Köhling and Veit Wagner from Jacobs University Bremen. M. Huth, C.-W. Chen, and V. Wagner, “Measurement of Hansen solubility parameters for organophilic fluoromica and evaluation of potential solvents for exfoliation,” Appl. Clay Sci., vol. 155, pp. 120–125, 2018. M. Huth, C.-W. Chen, J. Köhling, and V. Wagner, “Influence of Hansen solubility parameters on exfoliation of organophilic fluoromica,” Appl. Clay Sci., vol. 161, no. April, pp. 412–418, 2018. M. Huth, C.-W. Chen, J. Köhling, D. H. Taffa, M. Wark, and V. Wagner, “Prediction of delamination state of 2D filler materials in cyclic olefin copolymer for enhanced barrier applications,” Compos. Struct., no. April, 2018. Michael Huth currently works at the Physics and Earth Sciences, Jacobs University. Michael does research in Chemical Engineering and Nanotechnology. Their most recent publication is 'Influence of Hansen solubility parameters on exfoliation of organophilic fluoromica'.